John Marshall, Chief Justice of the United States Marshall studied law here under the tutelage of George Wythe, William & Mary's - and the nation's - first professor of law. This 1946 painting by David Silvette, a copy of an 1831 portrait of Marshall by Henry Inman, hangs in the Law School's entrance hall. Just weeks before Thomas Jefferson was to begin his presidency in 1801, incumbent John Adams appointed John Marshall as the young nation’s fourth chief justice. Generally considered to be the greatest jurist to fill that role, Marshall served under Jefferson, his political rival (and second cousin once removed), and four other presidents over the next three decades. 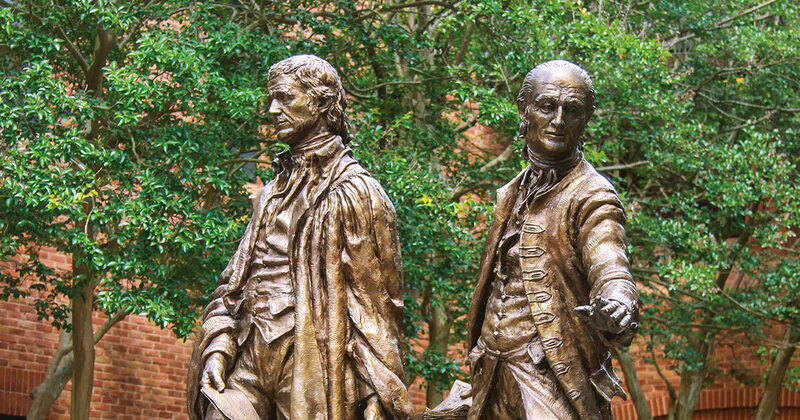 Marshall studied law at William & Mary under the tutelage of George Wythe in 1780. Marshall’s tenure here was brief but potent in forming the character of the person who would lay the foundations of American constitutional law. Largely self-educated, Marshall was born on September 24, 1755, in what is now Fauquier County, in the foothills of Virginia’s Blue Ridge Mountains. He was the oldest of 15 children of Thomas Marshall and Mary Randolph Keith. In youth he acquired a lifelong taste for English literature, poetry and history. Destined for the bar, Marshall set aside his law studies in 1775 to fight in the American War of Independence. As an officer in the Continental Army, he fought in the battles of Brandywine, Germantown, and Monmouth. He endured the sufferings at Valley Forge during the harsh winter of 1777-78. He was on leave from the army in 1780 when he attended Wythe’s lectures on law at the College. During his College sojourn, Marshall was elected to the Phi Beta Kappa Society. In nearby Yorktown he courted his future wife, Mary Willis (“Polly”) Ambler. After the war, Marshall concentrated on his law practice but also found time to serve in the Virginia state legislature. He eventually entered the federal government in 1797 as President Adams’s envoy to France. After a brief stint in Congress, Marshall entered the cabinet as secretary of state, the office he held when Adams nominated him to be chief justice. Marshall is best known for two important contributions to modern U.S. government. First, he established the power and prestige of the judiciary department, so that it could claim equal status with Congress and the Executive in a balanced government of separated powers. He asserted the judiciary’s authority to expound the Constitution as paramount law and to hold the other branches accountable to that law. Second, Marshall interpreted the Constitution in ways that significantly enhanced the powers of the federal government. He believed that those powers, though enumerated, should be construed expansively in order to accomplish the great ends of government. Though limited, federal power was supreme within its allotted sphere, superseding state power whenever there was a conflict. Marshall’s opinions were later used to justify the great expansion of the federal government in the late nineteenth and twentieth centuries. Marshall died in 1835, nearing the age of 80, without realizing the full impact of his long career as chief justice. He feared the Constitution would ultimately fail in the face of resistance from the states. But the groundwork was laid more surely than he knew, and despite the ordeal of secession and civil war, subsequent generations were able to carry his mission forward. His opinions are still taught in law schools today. Marshall exemplified his mentor George Wythe’s ideal of the “citizen lawyer” who devotes his professional knowledge and skills to public service. On and off the court Marshall displayed a character notable for its simplicity and utter lack of pretension. Something of that character is indicated in the rumpled vest and unkempt shoelaces worn by the bronze statue of Marshall that stands along that of Wythe at the Law School’s entrance. It is one of several on-campus reminders of the great chief justice. A more regal statesman and jurist is portrayed in a copy of an 1831 portrait of Marshall by Henry Inman (shown above) that hangs in the Law School’s entrance hall. The Marshall family Bible is on display in the Nicholas J. St. George Rare Book Room.